The text is about a new concept, ÒRelabi,Ó[i] which is similar to, but crucially different from the concept of ÒRhythm.Ó It is the name for an experiential gestalt—one that has many of the qualities of rhythm, but that also violates many of them in a sustained, original, highly focused way. Relabi is exactly as far from arrhythmia—from arbitrarily placed random sounds—as rhythm is, because it involves a strong sense of coordinated[ii] structure. Conceptually, it competes with rhythm in the sense that it is a complete, enclosed category of experience that can have a wide range of variation in its realization, and is more of an underlying principle, and abstract quality, rather than any specific performance. This is all the case even though Relabi is not currently a focus in the culture, and as an experience is new to most people. Relabi is any compelling, coordinated-seeming structure that is built up from a pulse or grid that is unstable in a way inherently difficult for human beings to grasp. For that reason, it can be said that in lived experience Relabi is a network of events grounded on a determinate pulse that Òself-erases.Ó The experience therefore produces a sustained sense of contradiction—of a pulse and of the simultaneous absence, the complete diffusion, of that pulse. The initial case is in relation to musical sound, although the principle probably has applications in other media, for instance, film and dance. Relabi may not be an entirely new experience, but it is a newly demarcated concept, and though this text will describe it, one needs to experience Relabi experientially for a period of time to intuit what it is, why it is unusual, and why it could be consequential. First, let me address the multiple definitions of ÒRhythmÓ that are in play. There is a broader definition of rhythm[iii] that includes any kind of structure unfolding in time, which complicates the discussion. Although that definition is legitimate, and might be said to absorb the concept of Relabi, it is not what people mean colloquially when they use the word rhythm. Rhythm has a narrower implication in general usage—namely that there are discernable structures that—to varying extents—create an at least partially predictable structure in the passage of time. It is this, more specific definition of rhythm I will address. To understand Relabi one must be willing to consider different aspects of rhythmic experience independently, and to be able to imagine that aspects which are routinely bonded (such as expectation of the next event, with regularity of the underlying grid) can be separated and organized in a new experiential configuration. Consider how we experience rhythm in music. Rhythm involves a discernable coordination among individual sounds—we say they have a clear relationship to one another, even if we canÕt intellectually unpack what that relationship is in a particular case. The coordination can reliably produce certain Òhigher-orderÓ sensations in the listener: anticipation of the time position of the next sound, sensory excitement, a desire to physically move, subconscious gridding of time, perception of determinate tempo, engaged anticipation, intimation of particular physical states or qualities of physical movement, evoked emotions, etc. It is not about the physical sound events themselves, but the way in which relations between them produce the rhythmic sensation, which like a sustained textural sound has its own specific quality, making it a whole, a ÒgestaltÓ to use the jargon of perceptual psychology. The sum of rhythm is therefore greater than its parts, experientially. There is considerable flexibility in this imputation of rhythm by an individual. Introduction of a new pulse, syncopation, or layer of sound events can instantly shift the entire frame of reference for a listener, recasting what came before in a different light (Òshifting the beat,Ó etc.) So it is important to note that the phenomenon of rhythm is not rigid, but involves considerable potential for subjective slippage, recalibration, and leaps of faith on the part of the listener. It is a broad category that unifies a variety of phenomena and allows for invention. It is also rife with relative definitions, and the listenersÕ habits and flexibility of mind can also play crucial roles in defining what they experience. Awareness of rhythm can be said to be like counting or language—a semi-conscious, semi-reflexive, semi-learned relationship to a particular category of experiential gestalt that we are apparently primed for pre-culturally. [iv] One may learn to appreciate and perform rhythms without consciously understanding how one is doing it. It also can be as much or more a kinesthetic as a cognitive experience—bodily sensations are often actively involved. There is a strong cultural dimension to the apprehension of rhythm. Appreciating or performing polyrhythms from West Africa requires a very different set of intuitions and pre-conscious skills than does playing medieval hocket. In Western classical music, one may say that pulse relationships are often made particularly explicit, sometimes in a didactic way, and of course an intense non-verbal culture has developed to explain and analyze these relationships in terms of mathematics. There are also many forms of music where pulse is treated differently from Western art music: where rhythms are additive rather than cyclical, involve phasing of tempos or phrases creating a polyphony of pulses, are subject to the whim of improvisors, involve frequently Òshifting the beat,Ó are arbitrary, are highly abstract, or otherwise depart from a single, steady, clear pulse. However, in our colloquial usage of the word, and even as it covers all these complicating cases, there is an underlying intuition of human-countable pulse structures; time is still noticeably ÒgriddedÓ in a discernibly regular way. If it is not, we usually refer to the experience as Òarrhythmic.Ó This defines the normal continuum, from a clear easily counted pulse, through complicating cases, to cases where it becomes impossible to count the pulse, and events are clearly not coordinated (at least the sense of coordination is lost to imminent experience, even if there is an abstract underlying structure of great complexity that the listener cannot sense). Relabi does not fit on this continuum. In defining rhythm for the purposes of this text, again, I want to focus on this specific aspect of the discernable pulse or regular gridding of time that underlies rhythm, even as it exhibits considerable definitional flexibility. The pulse may be implied, abstracted, complex, or weak, but it must be present in a way that it can be intuitively captured by the listener for the word ÒrhythmÓ to apply. This aspect of the definition of rhythm is especially important now that there is a word, Relabi, for a rhythm-like experience that puts a very different spin on this capacity. One initially hears Relabi as rhythm, albeit a ÒlooseÓ rhythm. Distinct events occur that seem to have an underlying order or grouping and that excite the senses as in rhythm, but an underlying pulse cannot be found. It is as if the pulse has been rotated into another dimension, but is still casting sensible, coherent shadows in the world we can perceive from an underlying structure we canÕt compute. [vii] This is because the pulse is engineered to be always shifting away from the listenerÕs expectation, an expectation that is formally suspended. It is tuned to be accelerating and decelerating fast enough within certain perceptual parameters to frustrate definitive identification, but not so varied that one ceases to unconsciously want to anticipate regularity. Importantly, the type and speed of change of tempo itself is abstract enough that it is not easily discerned by the listener as a secondary rhythm. Definitionally, the ÒtimeÓ of Relabi involves continuously transforming asymmetries—such that any two perceptually grouped events have an extremely low chance of being on the same scale as the second of the twoÕs relation to the following event (or a low chance of having ratios that are whole number multiples). But, this has to happen within thresholds of change where the listenerÕs attention is still engaged in anticipating the next event. In Relabi, there is a strong subjective imputation of pattern, but the pattern is self-erasing on both an intuitive and cognitive level. As a result, an additional excitation or mild disorientation is produced by the continual slight denial of the perceiverÕs expectation. From the perspective of rationalism,[viii] one is faced with nearly lined-up phenomena that have just enough relationship to each other to seem ÒpatternedÓ—and may have an underlying pattern of acceleration and deceleration that adds a quality of coordination but is too abstract to be directly discerned by the listener. The listenerÕs consciousness attempts to adjust the perceptions to fit an imputed pulse, adding to the richness of the experience of pulse, which continuously unravels (but not until the imputations have made some headway, creating a sustained interplay of implied and dissolved pulse). Just as something can be Òmore rhythmicÓ by being more predictable about where the next event might happen, things can also be Òmore RelabicÓ by having a more puzzling equivocation as to where the next event will occur—while at the same time not feeling or seeming arbitrary. Consider the ÒimpossibleÓ depictions in the artworks of M.C. 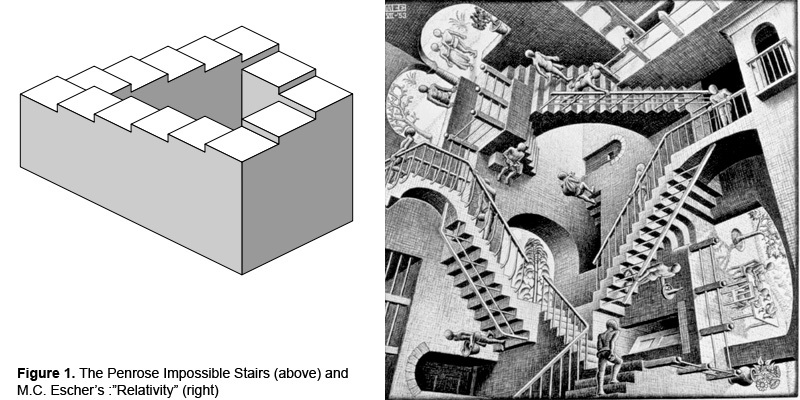 Escher, and well-known visual illusions like the 3-prong impossible figure and the Penrose stair (Figure 1). These figures rely on depictions of structure where the reference points for depth and connections are present enough to provoke the sense of space, but weak enough so that the eye loses track of the reference points as it scans the image, such that one part of the image seems to have an impossible configuration relative to another. [ix] In another example, consider the Shepard Tone, a continuously rising tone illusion. Similar to the previously mentioned visual illusions, the sense of an impossible—stationary but always rising—audio tone occurs because the listener consistently loses track of the fore/ground relationships of overlapping tones which fade in and out in a coordinated way (each new layer disappearing into a harmonic level of the previous layer). Here we already have examples of experiences (and ornate cultural productions) that seem Òwell-structuredÓ but that rely on Òperceptual slippageÓ for their unique content. In the same way, one can therefore understand Relabi as the Òillusion of rhythm.Ó However, this is philosophically unacceptable to me—since to make this kind of reactive valuation (as I am doing throughout this essay for purely heuristic purposes) is fundamentally philosophically prejudicial. It prejudices a countable, non-paradoxical gestalt over an uncountable one. [x] From my perspective, Relabi (like the visual impossibilities) is just as philosophically ÒstrongÓ—just as ÒrealÓ—as rhythm (or as non-paradoxical visual figures). The only arguments to consider these experiences as implicitly derivative or secondary are, for me, unacceptably circular. Now: Why would anyone want this Relabi experience? I maintain that much of what is exciting in musical forms involves an interplay between the setting up and denying of pulse expectations—the Òhuman dimensionÓ of music often technically involves accelerating past the pulse or delaying before it, not to mention slipping the pulse outright. The musical forms that are most revered as ÒgrooveyÓ make substantial use of weighting and asymmetry against a pulse. So, conventional idiomatic music—outside of most of Western Art Music—already has rhythmic tension (tension and release against a pulse) as an important form of content. Strictly from that perspective, it is interesting to put that content into a test-tube and purify it, so to speak. Some of the music that is most interesting to me has even stronger Relabic characteristics. Some of the music of Henry Flynt addresses the issue of Òslipping the pulseÓ in a particularly self-conscious way, working with interlocking rhythms that ÒblindlyÓ shift tempo by minute degrees. In other compositions, Flynt has rhythm guitar parts that continuously slip the pulse—within the context of an overall consistent sense of forward rhythm. These pieces are quite close to Relabi, but to my ear the effect is not as central or pronounced as is implied by my use of the term. In a very different way, some of Neil FeatherÕs music has the unusual characteristic of slipping the pulse with a high degree of frequency, as in his Òtrain music,Ó and much of his ensemble music, including my collaborations with him. Here again, the music has strongly Relabic characteristics, but falls short of fitting my definition of pure Relabi because the pulse slipping is not consistent—periods of consistent pulse build up and are discernable enough in that context to fall outside Relabi, even though the overall direction is Relabic and the pulse if frequently shifted, dispersed, made ambiguous. It is a matter of degree. This may seem like splitting hairs, but in identifying a principle, I think it is important to define what the ÒpureÓ manifestation is, in order to isolate the variable. I want to take the time to discuss some modern musical forms that may leap to mind but by my definition are not Relabi—not to make a value judgment about them, but to help clarify the relative definition (and therefore usefulness) of the term. Much of freely improvised music (of which I am a player) involves rhythms so abstract or diffuse that the sense of pulse is significantly suspended. Likewise, in Modern Classical music (Serialism and beyond) there is a strong emphasis on highly abstract rhythmic constructions, chance, stochastic effects, etc. that often results in ambiguity or complete dissipation of pulse. Likewise, contemporary dance music (IDM) addresses many of the same considerations from a different aesthetic vantage point, including abstract rhythms, randomness and the like. Although there may be isolated cases of Relabi in these areas,[xi] these approaches to music making typically address only one term of the definition of Relabi—the diffusion of pulse or lack of pulse—but crucially do not address the other: the sense of coordinated structure meaningfully built up from the equivocal pulse. So it is that while there may be many great and unusual experiences to be had in these areas of music, their methods and sensibilities generally contribute to Relabi only in a tangential way. Relabi puts the stronger of these effects of slipping-the-pulse that can be heard in other musical forms into a test tube, so to speak, and purifies them, making a self-consistent new type of form from their precipitate. It goes on to then use this material to draw the continuum of musical perception and possibility in a fundamentally different way. With Relabi, compositions or improvisations can be realized that have highly unique qualities and perceptual/kinesthetic effects. It is matter for substantial future exploration to understand and explore these. Relabi also opens a new set of aesthetic possibilities, which are of course, subjective in their value. Relabi also seems to have an unusual ability to induce odd states of mind, similar to, but different from the entrancing effects of complex polyrhythm or phasing rhythm. It makes you feel something unusual and yet simultaneously familiar enough to sound like idiomatic music (although it can also certainly be realized in more experimental music as well). Sustained exposure to Relabi can space you out in an strange way—a characteristic some may find annoying and others deeply desirable. How true Relabi can be created is an open-ended question and one that I do not want to try to answer definitively—rather, IÕd prefer to encourage experimentation and ingenious solutions. So, in this last section, IÕll just convey what I know about the subject to date, which is a work in progress in its earliest stages. It is clear that Relabi is, to a major extent, at least initially physically counter-intuitive for performers, who tend to establish and lock onto pulses, rather than to methodically dissipate them. To what extent this is cultural or neurologically hard-wired is an issue for empirical investigation—but I have a strong belief that Relabi, once ÒgottenÓ as a type of experiential gestalt, is something a human being can learn to reproduce. IÕve been focused on this issue in instrumental performance for some time. For years my circular-breathing saxophone improvisations have involved overlaying accelerating and decelerating fingerings on a monophonic instrument—producing a primitive, often uneven kind of Relabi—but the effect is more pronounced the more uniform the displacement of the pulse it. The one really clear performance I know of that is a perfect example of human-perfromed Relabi is documented on the record ÒThe Infinitive SessionsÓ by the Italian group Starfuckers. For the full length of a CD, a guitar-bass-drum synth combo produce a rhythmically tight, compelling ÒvampÓ groove that constantly slips the pulse with amazing consistency. Not much else happens, but unless studio trickery was involved[xii] that I donÕt know about, the record proves that human performers can produce music that satisfies the exact definition of Relabi. ItÕs funky, coordinated sounding, juicy and the pulse is always somewhere else. By definition—in a mathematical sense—this approach never generates time symmetry (or even whole number multiples) between beats the ratios of beats A and B to B and C, but the variation can be tuned to be within a range where human beings will still want to impute a sense of pulse. By the time perception has moved on to beats C to D or D to E, the initial imputation of tempo no longer holds. There may be an alteration of expansion and contraction, in a structured but unpredictable order, as if two tempos were expanding through each other. Because each step in the process is incrementally pushing or pulling each other step positions, the structures created have the unique property of permuting forced, endless inequalities of ratio that are at the same time clearly interconnected. Crucially, this Òrelabi waveÓ can be accessed from a variety of qualitatively different angles, because each of the metronomes holds the wave to a different extent since each retains some of its own quality, despite the feedback. The results are highly dependant on the starting tempos of the yoked metronomes and their mathematical relationships, with simpler number relationships producing more discernable types of coordination among events and more complex ratios producing more slippage. Each crest of the wave can be used to trigger an instrument or sequence of events, which will then have a ÒlockedÓ relationship to other events, albeit one that canÕt be easily intuitively unpacked by the listener. It is this coordination that provides music of the inherent ÒmusicalityÓ of the system. What would normally be the Òsub-divisions of the rhythm,Ó the different layers of event-density in the music, are derived by mapping each of the yoked metronomes, with their particular qualitative take on the multifaceted, constantly changing pattern, to different instrumental voices. The result is the dissipation of time scale without losing the ability to control the general range of density of events and to tightly coordinate individual events together. A related positive side effect is the production of complex, interesting phrasing, as these connected generators are used to control a variety of other sonic variables. Crucially, the events and changes that unfold in the music are—BY DEFINITION—not on a grid, but rather in a constantly flexing time continuum where streams of events are always slightly accelerating and decelerating, and all reference points are always moving away from any implied grid. To produce effective Relabi with these instruments, one has to go a step further and tune their variables so that the output of the system is within certain perceptual thresholds that produce many of the sensations of rhythm, setting of rhythmic expectations. As far as I can tell, it is beyond human beings to calculate the underlying structures—which creates the unique dissociation between the different familiar and unfamiliar aspects of the experience. There is a great deal to say about what is formally odd about this approach. First, it treats waves of acceleration and deceleration as the basic unit, rather than points on a grid or natural numbers. Everything is—elementally—in motion, subtly shifting all reference points all the time. The sound events themselves—are derived from crossing thresholds, which can be manipulated to change the relationship of the sonic results to the underlying wave structure in ways that are intuitive sounding but hard to describe. It is curves and multi-dimensional coordinate geometry as timekeeper instead of heartbeats and clocks. Second, the net result is that it mathematically suspends the answer to the question Òwhat is the frequency.Ó The speeds of the individual metronomes change the aggregate density of events—rather like shifting statistical parameters within noise, though this is a highly determinate system. Importantly, the forced asymmetries propagate among what would be the different levels of subdivision in a quasi-uniform way. (I think there are probably better ways to express the richness of this kind of mathematical structure, but I havenÕt yet found the words). Using this system, the Relabi I am currently producing comes from an odd interaction: using technology to create formal patterns that BY DEFINITION defeat the gridding of ÒrhythmÓ but that are also subjectively tuned to what best simulates human Òpattern discerningÓ experience—a strange kind of algorithm involving human control feedback in relation to thresholds of musical excitation. I can only speculate about other methodologies that could generate the sustained sense of coordination and suspended pulse that are Relabi. One area that seems promising is to use clearly discrete overlying structures containing pauses just long enough that they erode the listenerÕs ability to hold the sense of pulse. [xiii] I can also imagine other, randomness-plus-rule- computer based approaches, though I wonder if they would amount to less efficient versions of the technical approach mentioned above, which has the great benefit of automatically creating the unusual types of coordination between events—something that would need to be reverse engineered into any ÒrandomÓ system. My hope is that others will invent ways of creating Relabi that I canÕt imagine. [i] Re-labi, from Labi, to Òslip, glide, fallÓ—again. [ii] Coordinated, by which I mean having the subjective experience of a discernable relationship; apparently forming groupings; having a harmonious combination or interaction, as of functions or parts. As in rhythm, the sense of coordination may be palpable without the listenerÕs being able to explain how it works in analytical terms. [iii] Ezra Pound: ÒRhythm is a FORM cut into TIME.Ó A broader definition of rhythm than the colloquial usage. [iv] Crucially, I do not take this as a prescription that we are not also primed, pre-culturally, for Relabi. [v] Here I am intentionally stretching the idea of a gestalt to areas that are relatively cognitively alien to the current civilization, as is the conceptual content of phrases like Òa small uncountable plurality,Ó or Òobject constantly merging into its background.Ó However, I maintain that any sustained, qualitatively distinct experience that does not impair the perceiver can be labeled to form a new conceptual/experiential gestalt category. The value of such labeling is to provide descriptive control over phenomena—even if it violates what is cognitively routine, norms of attention, etc. [vi] As might be the case with some aleatoric, free-improvised, or stochastic modern music where the logic of event location is radically de-specified and there is no sense of pattern or intimation of a coordinated series of perceptual events. [vii] Thanks to the composer Melissa Moore for clarifying this metaphor. [viii] How Relabi works—its characteristics—is a little bit technically obscure but completely explicable in the context of rationalism (by which I mean science and its philosophical corollaries). That it can be explained technically in those terms does not prevent the kind of experiential gestalt that Relabi is from contributing to experiential counter-arguments to some of rationalismÕs least dispensable conceptual machinery—denumerability, symmetry, time-consistency, etc.—since rationalism launches its platform from and is seen through the lens of lived experience. [ix] Importantly, not all visual illusions rest on this principle. For instance, with the Necker Cube and its variants, it is possible to apprehend the ÒimpossibleÓ configuration directly, all in one given perception. The eye does not have to Òlose trackÓ of anything in a discernable way to encounter an impossibility. [x] There are issues of logical ontology here. If rhythm is considered as a tree structure built up from the possibility of equal spacing (nominally, 1 equals 1), then Relabi is a tree structure built up from units that are equally vivid but donÕt measure well in perception (nominally, 1 does not equal 1). [xi] I donÕt claim to know. I suspect in IDM there are contemporary examples IÕm not familiar with that may completely qualify as Relabi. The works of the contemporary classical composer Lois Vierk may include passages of Relabi. IÕm generalizing here in the service of clarification. [xii] If anyone knows how to get in touch with them, IÕd love to discuss this with them. [xiii]Thanks to Drew Daniel for suggesting this idea. [xiv] C.F. the works of the philosopher Henry Flynt on www.henryflynt.org for the notion of experiences which break normal inference patterns and produce a new logical analysis. I donÕt claim the same importance for Relabi as, for instance, I would for FlyntÕs Necker Numbers, but I think the phenomena have some overlapping considerations in common.